For the past few years, a group of like-minded educators have gathered to discus the specific issues involved with the teaching of web design. The group was formed by my good friend Richard Eskins at Manchester Metropolitan University and this year’s Web Teaching Today event was hosted by Richard at MMU. I took the opportunity to bookend the get-together with two trips to the Lakes with the prospect of bagging my 100th Wainwright. My key task on this trip was to complete the Far Eastern Fells and I began the visit by tackling the most easterly (and lonely) of all the Wainwrights. I was following a walk designed by Stuart Marshall, from his book Walking the Wainwrights. The premise of this book is that it covers all the Wainwrights in the minimum number of circular walks. In this case, just 36. Each walk is designed to be walked in a day (providing there is enough daylight). Up until quite recently, I’ve considered Stuart’s routes to be slightly ambitious and have used the book to plan shorter versions or variations. However, I’m now confident enough in my fitness and my navigation skills to attempt some of his longer walks. 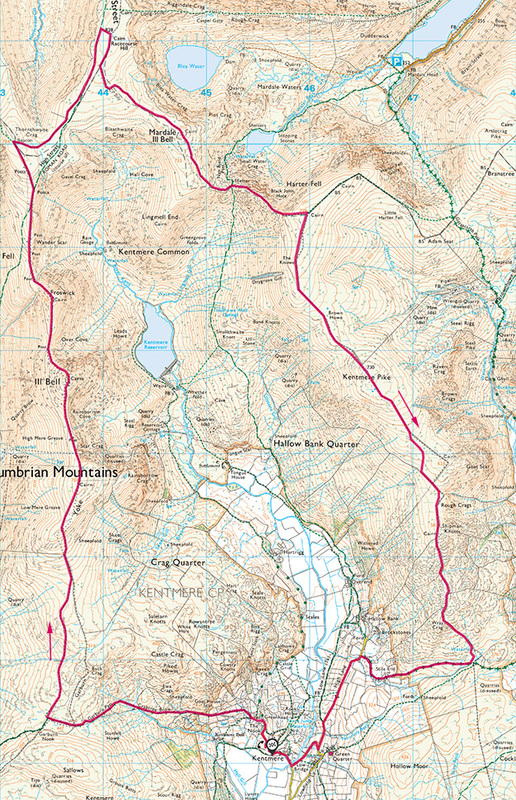 The Swindale Round includes just 4 Wainwrights and at 11 miles, is one of Stuart’s shorter routes. Ideal for a day when I had to drive a couple of hours to the start point (I’d stopped over in Southport on the way up to the Lakes). A Swindale Round (19.6km and 857m of ascent). Start/end: roadside parking near Swindale Foot. The day had started bright and fine and I’d even managed to locate the rather desolate start point. I booted up and set off in good spirits. These fells are not frequented (except by Wainwright baggers), so there are few well-worn paths to follow and I often found myself tramping over open fell, which makes the going quite slow. The route up to Selside Pike via the old corpse road was clear enough until I left that path to head for the summit. Cloud had rolled in and the whole scene became quite dreary. Only a kestrel, repeatedly rising on thermals and then diving, seemingly for the joy of it, lifted the mood. One of the beehive cairns at Artlecrag Pike. Selside Pike summit is disappointing. Granted, there is a shelter cairn, but not at the actual summit, which is no more than a small patch of bare rock. I stopped only long enough to take a photo and headed on to my next summit, Branstree. The walk to Branstree is a little more exciting, with good views and a clear footpath. Chief among the attractions on the route are the finely built “beehive” cairns at Artlecrag Pike. Branstree summit, like Selside Pike is no more than a point on the ground but here there is the curiosity of an Ordnance Survey triangulation disc, an alternative to the more usual pillars. Other than that, it has nothing to commend it. 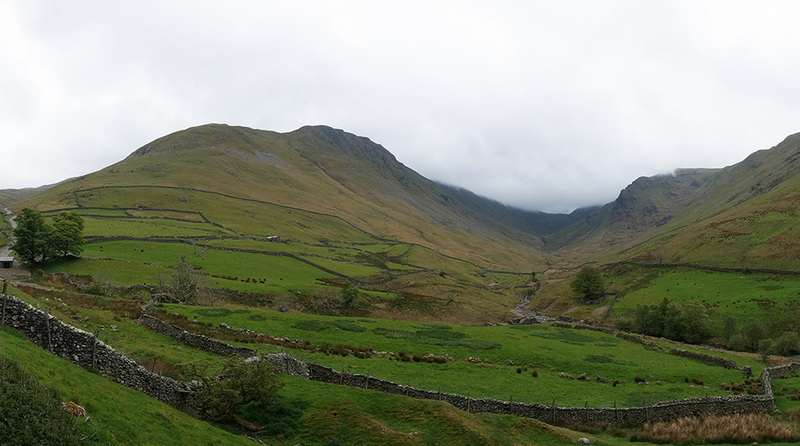 Wet weather was on the way and as I turned left to follow the wall down Selside Brow, it began to rain and by the time I reached the Mosedale bridleway at the bottom of the descent, I could see Branstree shrouded in mist. For a few moments, I considered bailing out of the walk and taking the bridleway back but I decided to push on and started the steep climb up to Tarn Crag, hoping that the weather would improve. By the time I reached Tarn Crag summit, the rain had eased but a light mist restricted distant views from the top. There’s a small cairn at the summit but the most identifiable feature is the survey pillar a short way off and worth a quick visit. It was built for the Haweswater Aqueduct project, which began in 1935 and transported water from the Haweswater reservoir to Manchester, 63 miles away. The slender stone cairn at Harrop Pike. 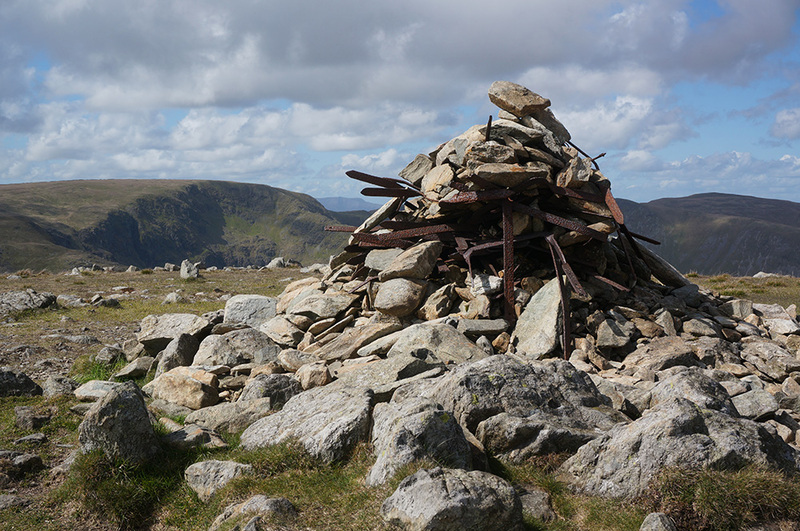 There’s also a small cairn at Grey Crag summit but little else of interest. The view is apparently quite good but in mist there was little to see. I headed back via Harrop Pike (best cairn of the day) and then the long tramp over open fell down to the bridge at Mosedale Beck. At this point in the walk, I was thanking my lucky stars that I would never have to do this walk again. 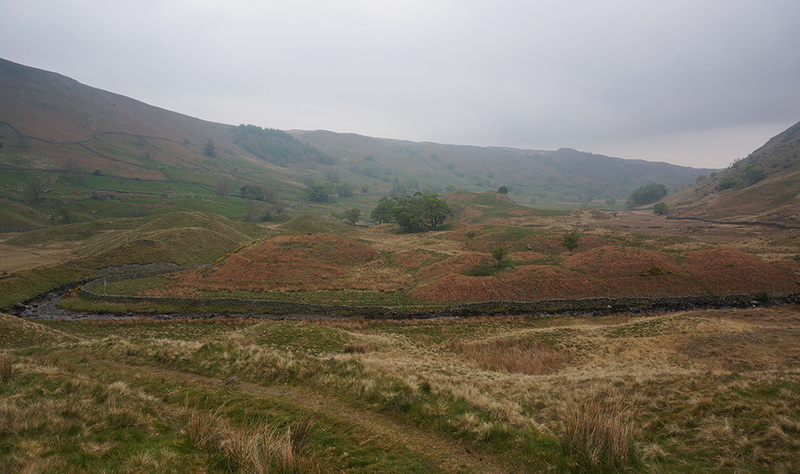 In truth, there’s little to commend it, except for the climb down to Dodd Bottom and the unusual moraine features there. I had, at least, completed the worst of the Far Eastern Fells and had some of the best to look forward to. Hummocky landscape in the upper Swindale valley, formed by moraines (the debris dropped by melting glaciers). The following day it rained in the morning so I delayed the start of my walk, knowing that it was relatively short at just 6 miles. 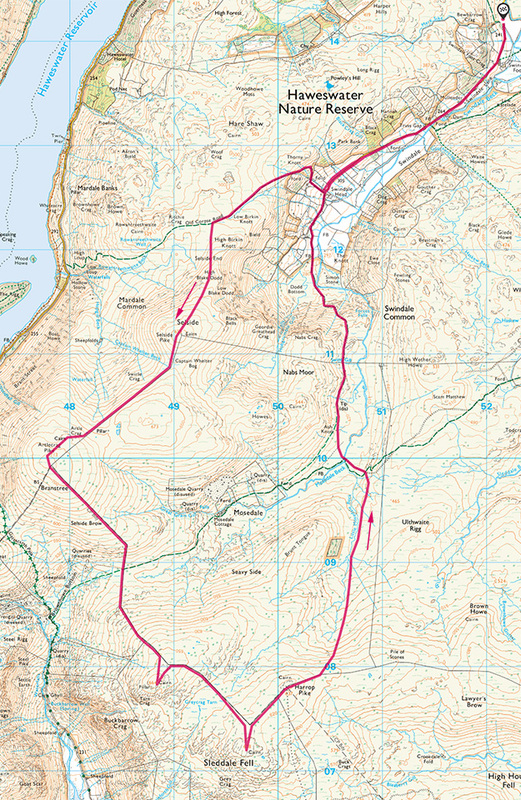 This was a walk I’d devised for myself based on the tops I still needed to do. Gray Crag, Pasture Bottom and a cloud-shrouded Threshtwaite Mouth. I parked at the Cow Bridge car park near Brothers Water and set off for Hartsop and Gray Crag. The fells in this area have very steep flanks and there’s always a steep slog at the beginning of any walk. I still remember the punishing climb to Middle Dodd I did 15 months earlier. Fortunately, my fitness has improved since then and although this was a similarly steep climb, I managed to get to the summit in just over an hour. 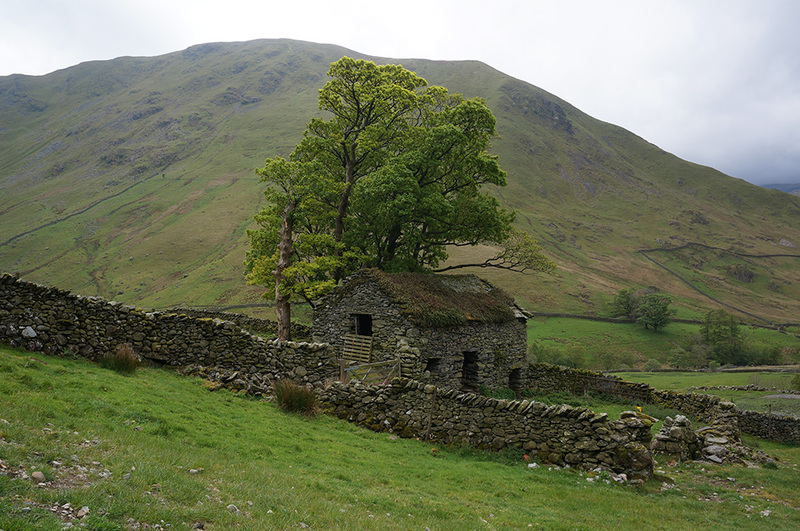 Old barn on the track from Hartsop to Grey Crag with Hartsop Dodd as a backdrop. 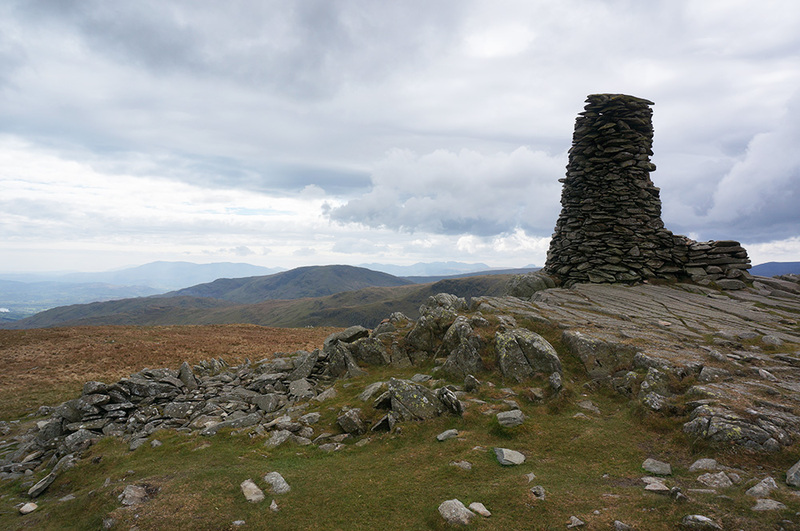 From there, it’s a relaxing (but very windy) ramble of just over a mile to Thornthwaite Crag with its impressive stone-built beacon. The cloud was high and the sky generally bright with good, clear views and this section of the walk felt like just reward for the hard slog. 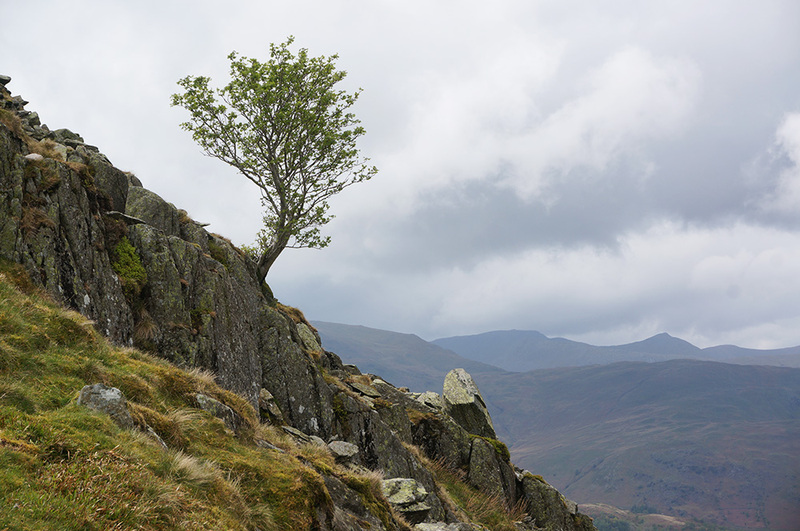 A lone tree on the steep slopes of Grey Crag. Thornthwaite Crag is a favourite stopping point for those fellwalkers. Not only is it clearly visible from a distance but it has a high stone wall behind which walkers can shelter from the battering wind and have a sandwich in relative peace. Just like the other half-dozen people there, I found a perch and took on some fuel. Hayeswater and The Knott from Grey Crag. Maps aren’t that great at showing what a place is actually like. On paper, the drop to Threshthwaite Mouth looked steep but manageable. In reality, it’s a difficult route over loose scree. Although there are paths, not all are stable and no main path has become established. So the going was slow and slightly precarious. At the bottom, there’s a great view along Trout Beck to Trout Beck Tongue and Windermere but the real reward was what came next. Again, the map belied the reality. It looked like a steep climb up to Stony Cove Pike (Coledale Moor summit), and it was but this was a really delightful scramble over stable rock. Looking across Threshthwaite Mouth to Caudale Moor and the rocky climb to its summit. Coledale Moor has a respectable summit cairn and a great view across the Trout Beck valley to Froswick and Ill Bell with their pyramidal summits breaking the skyline. The final leg of the walk began with a gentle downhill stroll to Hartsop Dodd. By now, the wind had lessened and the going was really pleasant. 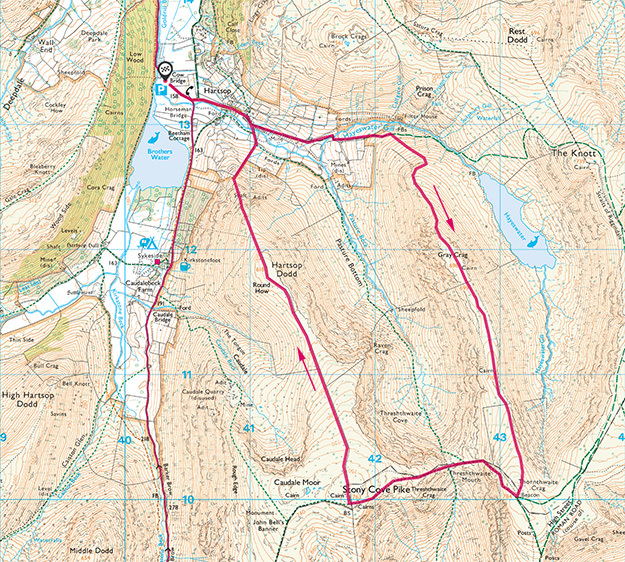 A Hartsop Round (11.0km and 872m of ascent). Start/end: Cow Bridge car park. There is a cairn at Hartsop Dodd summit but it’s not at the highest point. This summit has the distinction of being marked by a stout wooden post, driven into the earth beside the low wall that runs along the ridge. All that remained to complete this thoroughly enjoyable walk was the steep drop back down to Hartsop and a short walk back to the car park. I was very glad I’d decided on a clockwise walk as taking this route in an anti-clockwise direction would have meant a very difficult negotiation of Threshthwaite Mouth. Thornthwaite Crag beacon, looking south west. The third walk on this visit was one I’d been looking forward to for some time. 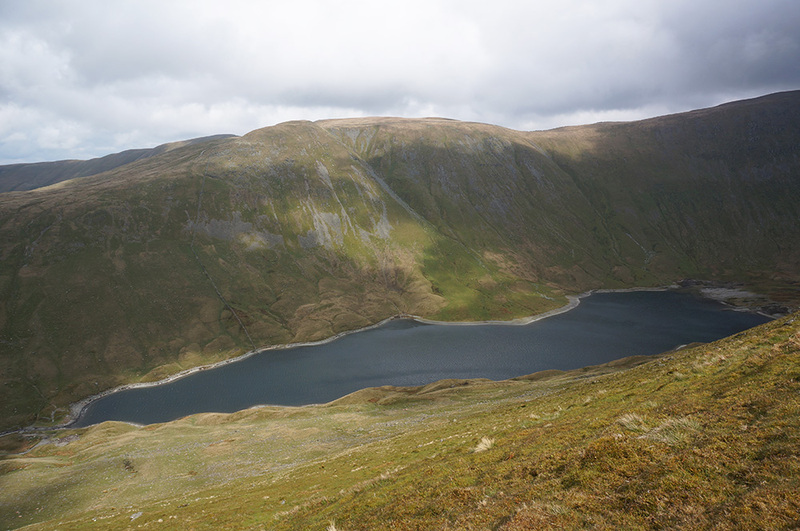 The Kentmere Horseshoe takes in 9 Wainwrights in a long 15.5 mile trek with 1160m of height gain. It requires a full day and reasonably good weather. Fortunately, the weather was perfect and I set off immediately after my YHA breakfast and parked in the seasonal car park at Kentmere. By 8.30am I was already climbing out of Kentmere on the Garburn Pass track and it would be 5.30pm before I got back to the car, a 9 hour walk. The Garburn Pass is a popular route and despite the early hour on a Sunday morning, I passed a number of mountain bikers, fell runners and other walkers going the the opposite direction. Fingerpost to Garburn Pass at Kentmere; the start of the Kentmere Horseshoe. At the top of the pass, I turned right and followed the ridge path towards Yoke. But not before seriously considering a quick “smash and grab” of Sallows, close by. I decided that, in view of the walk ahead, I should probably leave Sallows to another day. 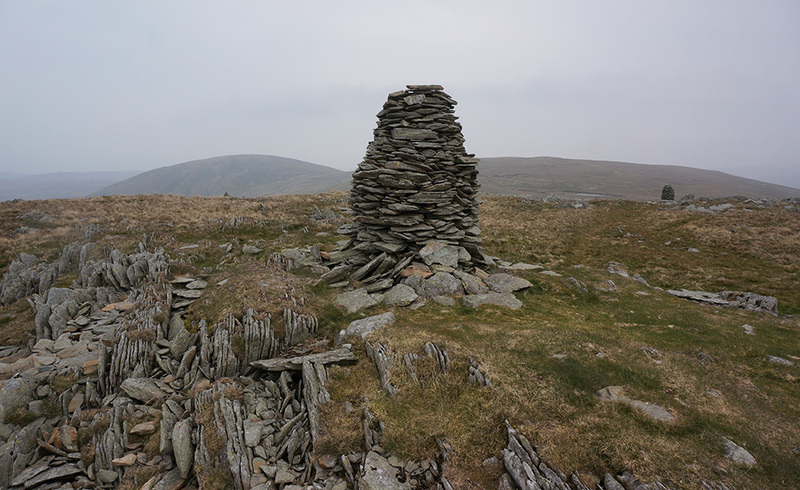 Yoke is a 2 mile, up-hill hike from Garburn Pass but there’s a generous cairn at the summit, sitting on a rock platform (a proper summit) and a great prospect ahead as almost all of the days walk is visible. 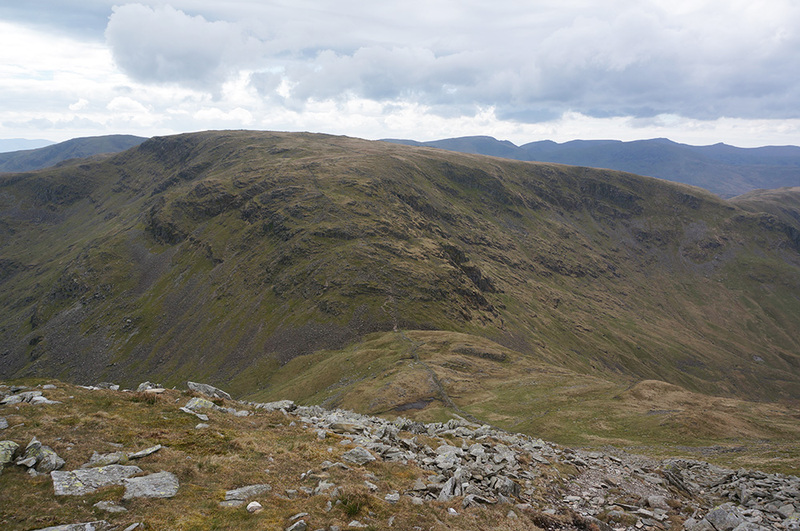 From this point to Thornthwaite Crag, the walk is an exciting series of ridges and peaks. Next up, Ill Bell. The approach to Ill Bell summit from Yoke. Ill Bell looks like a proper mountain; steep sided, pointy and with a tall summit cairn, you couldn’t really ask for a better fell top. On the approach, the clouds darkened while the peak was bathed in sunlight, making for a very dramatic vista. 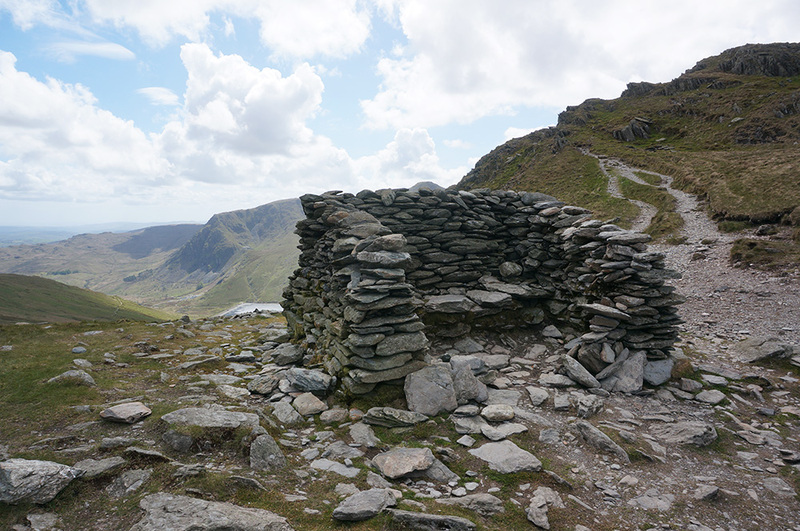 Ill Bell summit has 3, expertly-built beehive cairns sitting atop rocky outcrops and some great views, definitely a place to pause but it was too early for lunch and I was already thinking that Thornthwaite Crag would be the best venue for an extended break. Another descent, another ridge and another ascent and I was at Froswick summit with a great view back to Ill Bell and a generous (but unstructured) cairn. 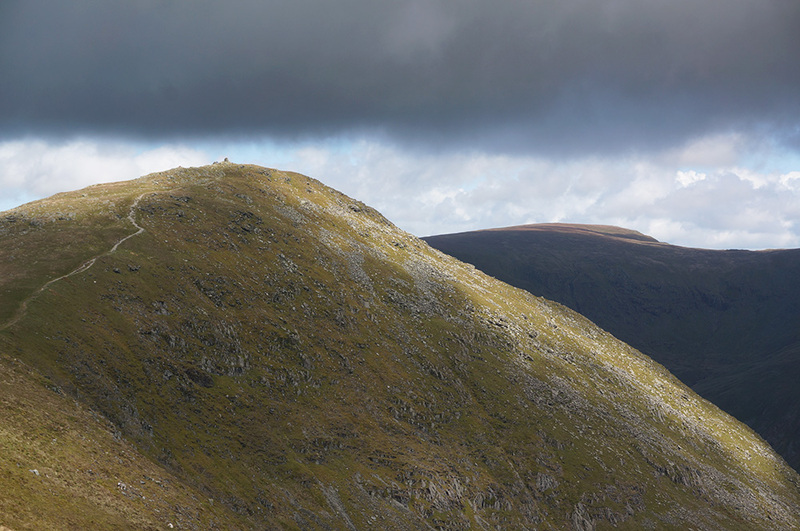 To the north, the beacon at Thornthwaite Crag was clear on the skyline and I headed off in that direction. 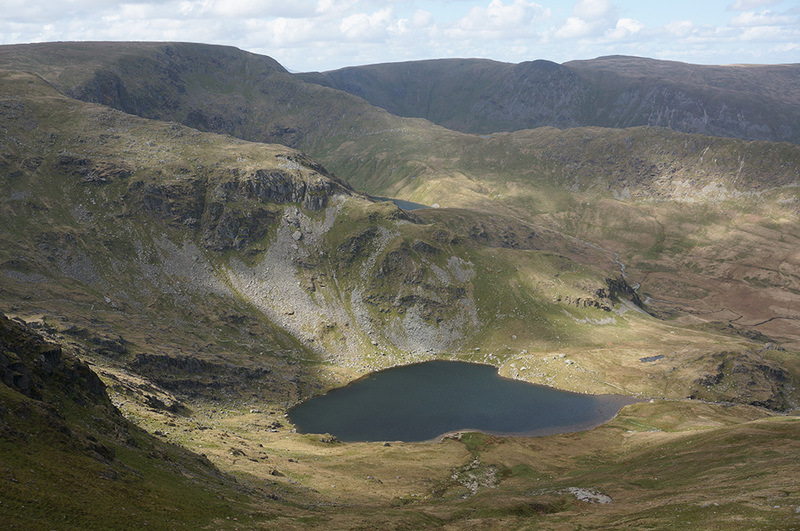 The Greater Kentmere Horseshoe (21.4km and 1159m of ascent). 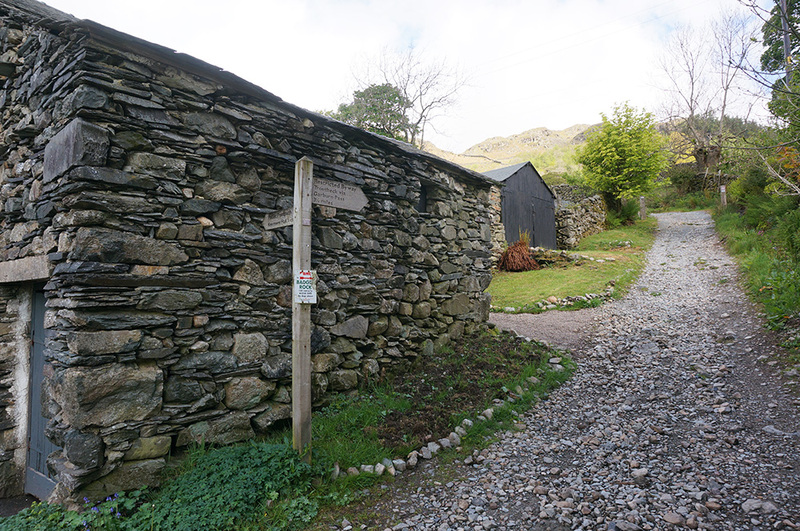 Start/end: paddock car park, Kentmere. It’s amazing how different the same place can be in different weather conditions. On this day, the sheltering wall at Thornthwaite Crag was populated by about 10 cheerful walkers, munching on carefully prepared sandwiches and generally enjoying life. Only the day before, the scene was of battered souls grateful for the sanctuary of shelter. I joined them for lunch and decided I was making good time. After lunch I set off on the gentle walk to the highest point in the Far Eastern Fells at High Street. On the way, there’s a fantastic view of the ridge walk I’d done the previous day from Grey Crag to Thornthwaite Crag and beyond it, the ridge from Caudale Moor to Hartsop Dodd. Despite its height, High Street has a rather tame summit. An Ordnance Survey triangulation pillar sits in the middle of a wide, flat ridge among the remnants of a broken-down wall. It doesn’t feel like a mountain top although that might just be because I’d recently visited Ill Bell. Fingers pointing at the sky. 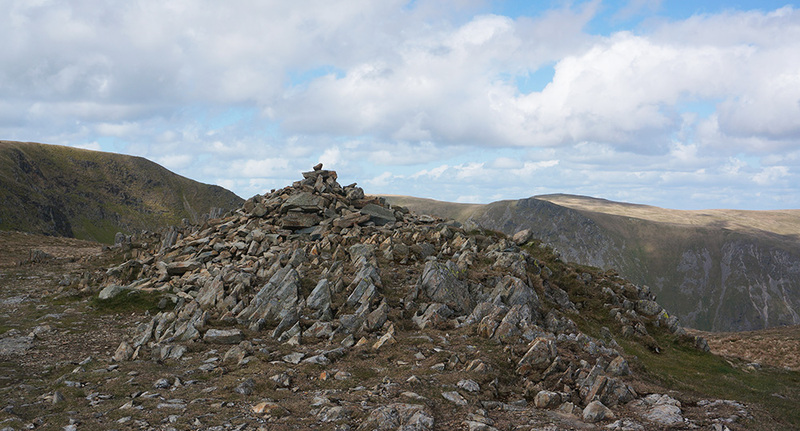 The summit cairn of Mardale Ill Bell. The next summit is Mardale Ill Bell, which has a lovely summit cairn, whose iron-stained stones contrasted perfectly with the blue sky. The dramatically angled bedding planes result in a series of stone “fingers” pointing skyward. The shelter at the head of Nan Bield Pass. The next obstacle was the Nan Bield Pass. A steep drop down and an equally steep climb up to Harter Fell. The drop turned out to be easy and there is a lovely stone-built shelter at the top of the pass that even has a stone seat. The climb out afforded some fantastic views down to Small Water and further north to Ullswater. By this time, the cloud had broken and I was treated to some dramatic shifts of light and shade. Light and shade on Small Water from the steep path up to Harter Fell from Nan Bield Pass. Harter Fell has an unusual summit cairn, consisting of an arrangement of old steel fence posts and stone and (to be honest) this was the last interesting part of this walk. The return ridge, taking in Kentmere Pike and Shipman Knotts is rather dull by comparison to what had come earlier but there are some great views across the upper Kentmere valley to Ill Bell and Froswick. The descent from the ridge is the best bit with a clear path leading through some very rocky terrain, dramatic in the afternoon sun. 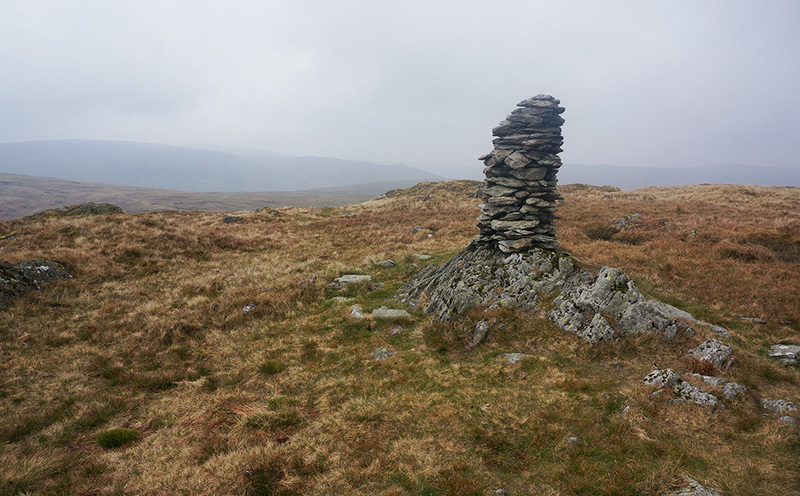 The unusual summit cairn at Harter Fell, looking back to High Street. Dropping down to Kentmere, there are some lovely views of the valley and the lengthening shadows really showed off the landscape to best effect. I arrived back at the car, knowing that I’d experienced a great walk. 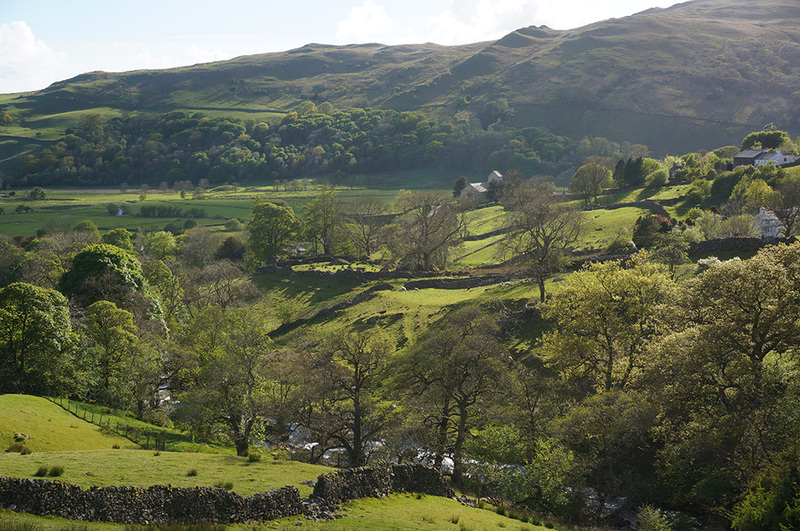 Kentmere and St. Cuthbert’s Church in the late afternoon sun.